Some options are only available on certain models. Some details may vary. The company sometimes sends me different colors and styles than what are pictured here, but I promise that the quality is equivalent, or I'll go shop elsewhere! 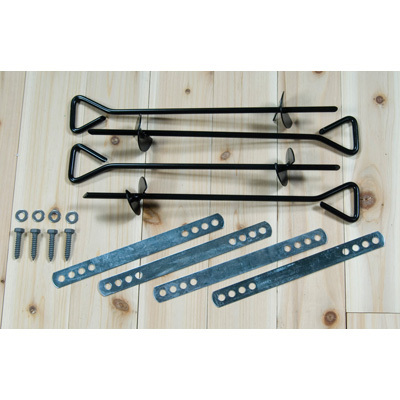 All three sets come with the shorter slide, hung from the four-foot deck. 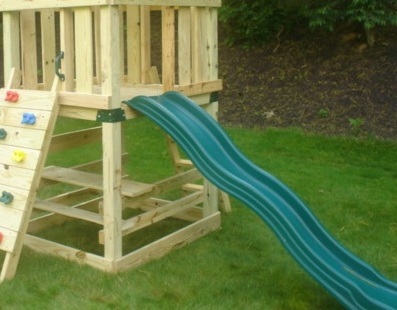 But only the Papa Bear can handle the LONG SLIDE, hung from the five-foot deck. You cannot hang the long slide from a four-foot deck. Your kids will go so slow they will actually give up, stand up, and walk down. 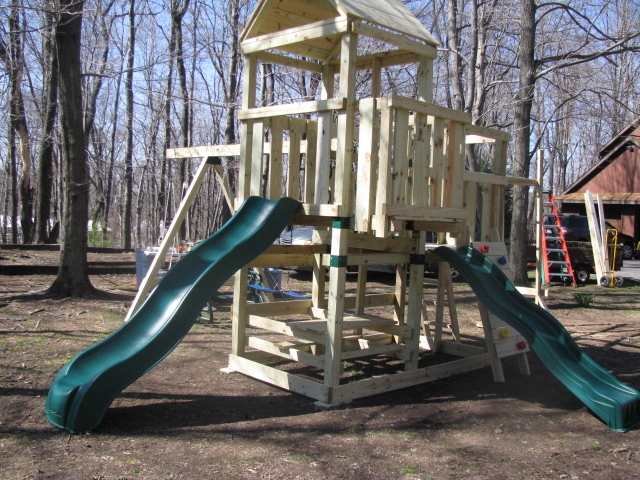 If you want a longer slide, you need a five-foot tower. The long slide is FAST! Your kid will hit the ground running. But if your kid is only 3, the long slide may be too much. You can upgrade to the Longer Slide. Replace your shorter slide with the longer slide. You can have BOTH! 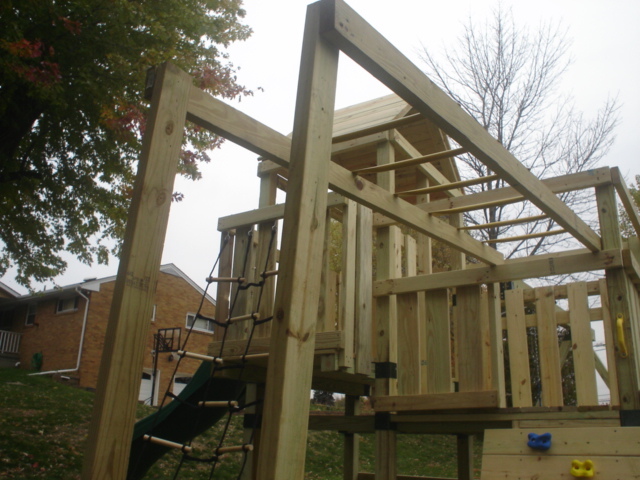 Keep your shorter slide from the lower deck and ADD a longer slide from the upper deck. 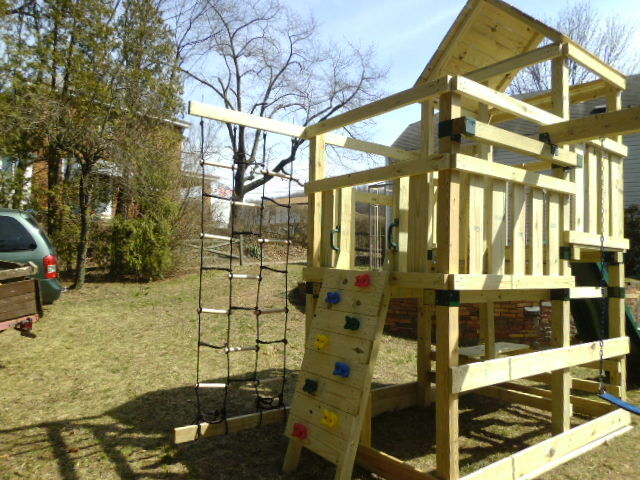 What kid would EVER climb in using the stepladder when you could use the monkey bars? The rungs are painted metal. Not another way to climb into the fort; only another thing to climb on. The manual says you should do it, but I think that is just CYA. I never do. These sets are MASSIVE! You and I could hang out like we were in a sail boat race, and we would not tip it. But if you want, they are available. You could have a pair at the feet of the 'A', or a pair at opposite corners of the tower, or both. Alternatively, you can wait until I'm gone, and see if your set rocks. You can always add these later yourself. 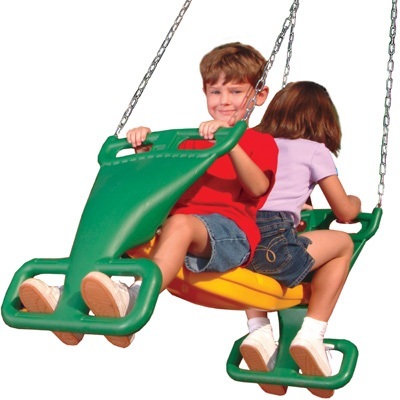 They are available wherever swing sets are sold. Some soil is not suitable. Take a shovel, stand on it, and hope it goes in, ready for you to lift a shovel full. But DON'T DO IT! If you feel like you could be digging a hole, then your soil is good! But if you can't dig your shovel in because it's too rocky, it will be too rocky for these anchors, too. And if you dig the shovel in without standing on it, then your soil is too loose, and these anchors won't grab. They will just stir your dirt as you try to screw them in. If your soil is not suitable, I will give you a refund. All three sets get the same 12-foot swing beam. Everybody gets a 12-foot beam, with two sling swings, an extra pair of hangers, and nothing beyond the 'A'. So the remaining options apply to all three sets. What to do with the extra pair of hangers? Baby not included. You wouldn't want this kid anyway. He's probably a spoiled actor baby. Little Tikes. Nine months to four years. Two shoulder straps and a T-bar. The T-bar folds under when your kid gets old enough to be insulted by it. 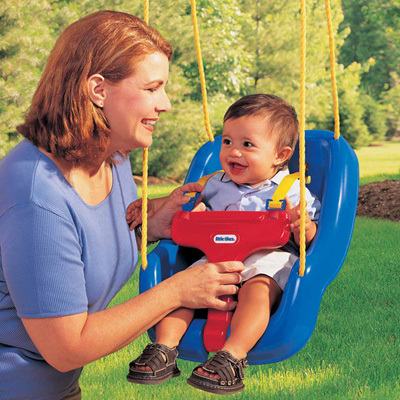 If you don't need a baby swing, You can add a third swing. Or even a FOURTH beyond the 'A' (IF you order the extra pair of hangers beyond the 'A'. 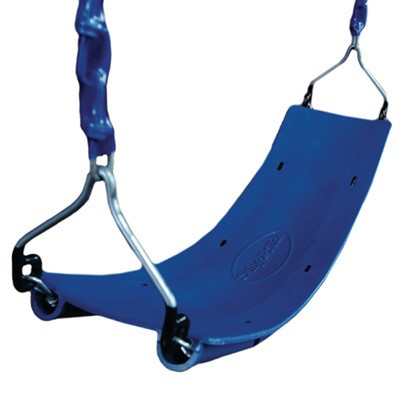 You can buy swings anywhere, but this one will match the other two! This swing is EXCELLENT! The chains are plastic coated, so they won't pinch fingers. 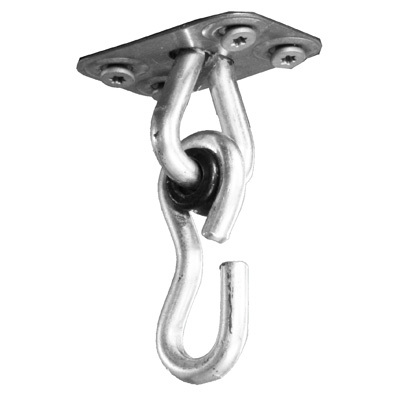 Support chains are threaded through the seat for extra strength. It can even hold Uncle Edgar! Your kids will feel like they're performing in a circus! Cheaper than sending them to clown college! You get three pairs of swing hangers on the beam, and nothing beyond the "A". 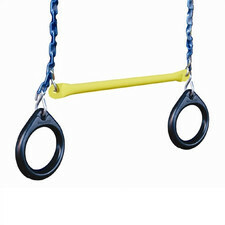 The disc swing and the tire swing can go into crazy orbits, so it's best to keep them away from the sling swings. The Rocket Glider usually goes beyond the "A", because it has its own hardware, and cannot use a pair of swing hangers. But I will install it inside the 'A' if you want both the Tire Swing and the Rocket Glider. Two kids won't realize they are learning cooperation. One kid can ride alone, too. 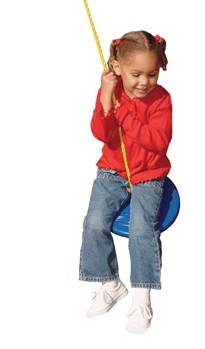 I remember REAL tire swings! The edges cut into your legs. There was always some water at the bottom. A good home for mosquitoes. 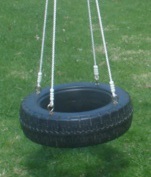 This tire swing only LOOKS like a real tire. No leg cutting. No mosquitoes. Two kids (or even FOUR!) can ride. Simple. Yet you can swing in circles, and spin while you orbit. You have three pairs inside the "A". You can get another pair beyond the "A". Put three sling swings inside the "A", and hang a baby swing out beyond the "A" where it might be safer. Or get four sling swings. Those little screws do not hold the weight of the kid (or a drunk uncle). The bolt goes THROUGH the swing beam. These little screws just keep the bolt from twisting.